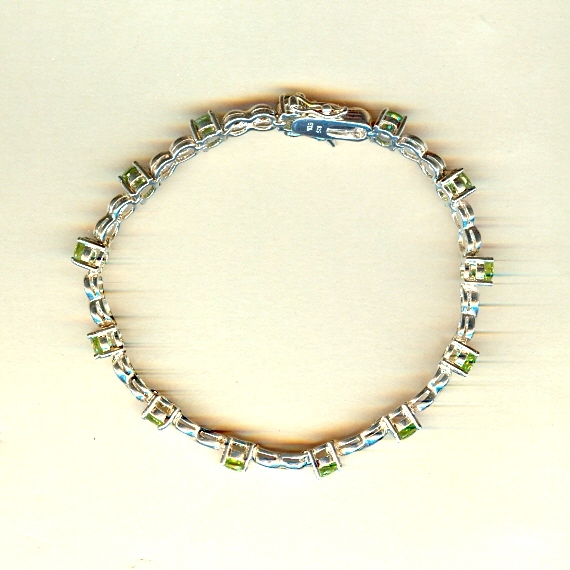 Wear the green fields of summer on your wrist with this lush and lovely peridot and sterling silver bracelet. In this flexible silver bracelet, a baker's dozen 5mm faceted round peridot gems are securely prong set between figure-eight stations. The 7-1/2" sterling silver bracelet closes with a push clasp with a safety catch on either side. 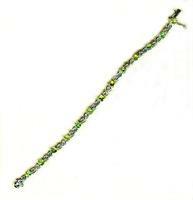 This peridot and sterling silver bracelet is a grand gift for the August-born lady, for the lover of green, or for anyone who appreciates the finer things in life. It?s another spectacular gemstone and sterling silver bracelet from SPARKLE PLENTY. As scintillating as sunlight through a canopy of leaves, peridot is the summer goddess of gemstones.